I learned about Sean Carroll, theoretical physicist at Caltech, through various interesting YouTube videos on topics such as the non-existence of an afterlife, theism versus naturalism, the arrow of time, the relation between the laws of nature and the meaning of life. 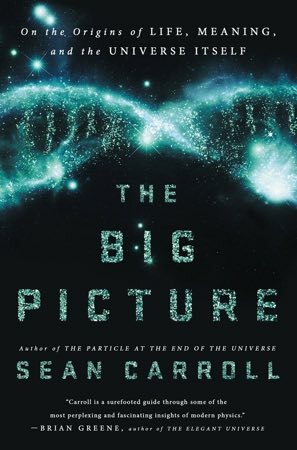 Elaborating on that latter theme, Sean Carroll has written an extremely ambitious new book called The Big Picture, On the Origins of Life, Meaning, and The Universe itself in which he, as the title suggests, presents a view on everything trying to integrate what scientists have discovered about cosmology and particle science with a view on meaning of life and morality. Many people are curious about what physicists do and know. We are aware that physics is hard and that much of what physicists do and know is inaccessible to us because we lack the required mathematical skills and content knowledge. We are also aware that physicists' knowledge has contributed to enormous achievements. This combination of not understanding what they do and know and seeing that 'it works' has given physics a high status among scientific disciplines. Famous physicists such as Albert Einstein and Stephen Hawking are among the most admired scientists. We may be inclined to think that these people, so much smarter than the great majority of us, also have deeper insights into questions of meaning of life and morality. This inclination may be the reason for the great interest which there now is in Sean Carroll's book. There is much to appreciate in Sean Carroll's efforts to try to communicate to the general public the content of his discipline. It is a way of trying to bridge gaps between the scientific elite and the rest of us which enables scientists to be accountable to society and which may inspire new generations for science. Carroll is especially courageous for trying to go beyond his own discipline and taking on the challenge to answer questions of meaning and morality and answer how they are related to questions of physics. Many of the parts in the book in which he describes physics are interesting and lucid. I think many of these parts will leave the reader with the sense of understanding these topics at least a little better. Also interesting is the author's explanation of how reality can be viewed of as consisting of multiple layers ranging from the fine grained level of subatomic particles or quantum fields to macro levels such as, in ascending order, chemistry, biology, psychology, and sociology. Several things are important to understand about this. First, higher level phenomena cannot violate laws of underlying layers of reality. Second, there is the phenomenon of emergence which describes the higher layer phenomena which cannot be reduced to (explained in terms of) constituent parts. 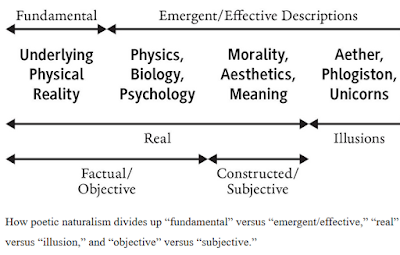 Third, different layers of reality (/levels of complexity) can be seen as different domains of application which need different types of theories/explanations. What follows from this is that it makes no sense to think about morality, meaning of life, free will, and such concepts in terms of, for example, basic laws of nature or basic particles. While those laws and particles constrain what is possible and not possible at high 'levels' of reality, such human concepts cannot, due to emergence, be fully explained in terms of laws of physics and basic particles. Another interesting topic in the book is Bayesian thinking which is a tool for updating beliefs which is relevant for both science and everyday thinking about reality. In Bayesian thinking our previous beliefs about reality (priors) are used to assign probabilities to possible outcomes and when new evidence comes in our beliefs are updated. There are also several things which I like less about the book or which I find less convincing. One example is the term poetic naturalism which Carroll introduces. Previously, he has always described himself as a naturalist. I think that is a great term and I am not convinced that adding the adjective poetic is an improvement. This term poetic refers to his view that different domains of application require different ways of talking. You may think I am nitpicking but I don't like this emphasis on language and talking. Apart from language there are other tools for understanding and describing reality such as mathematical models and visualizations. The emphasis on 'ways of talking about reality' takes me back to some social constructionist philosophers who proposed that language, and only language, mirrors and shapes reality, and I don't want to go back there. Another issue I have concerns about is what he says about morality. Carroll does not agree with physicists who argue something like: "the universe has no purpose and morality therefore human purpose and morality are illusions and science has nothing to say about them." (Steven Weinberg seems to think along these lines). Carroll argues from his view on layers of reality that something like morality, an emergent phenomenon, is meaningless at the level of atoms but meaningful at the level of human beings. The picture below shows how Carroll makes two distinctions: (1) between real and illusionary, and (2) between objective and subjective. These distinctions are valuable but I quibble with the assertion that morality and aesthetics should be squarely placed in the subjective box. From the fact that morality is a human construct and that it is meaningless outside of human experience does not follow that it cannot be scientifically studied and that no level of objectivity can be reached in assertions about morality. In fact, this assertion, in my understanding, is inconsistent with Carroll's own view that different layers require different types of explanations. The theory of evolution exist only in the domain/layer of life and its meaningless at lower levels of reality and in the gigantic part of the universe in which there is no life. This does not mean it cannot be objectively approached and that no level of objective knowledge can be reached about it. Nothing precludes us, within the narrow domain of human experience, to study morality objectively and to discover at least some objective truths about it. That morality is a moving target both in terms of how we define the concept of morality and what we think are moral behaviors does not change this. Conclusion: Of course I recommend this book. Anyone who is courageous and ambitious enough to write a book like this is bound to fail to some extent. But this is the type of failing with is very praiseworthy because it shows honesty and responsibility and it may help us to collaboratively develop our understanding of reality.